Screensavers are software applications that are normally used to be launched whenever windows computer is left idle or inactive. On a Windows Computer, you can configure separate Screensavers for every user configured onto a windows computer or workstation. You can even configure a login screen screensaver that will be launched when no user is signed on computer is locked or no user has signed onto a windows computer. The Screensaver presented above is a Screensaver that can be used to control a windows computer. You can use the above Screensaver to Restart Idle Computer. Similarly you can use this Screensaver to Shutdown , Hibernate or even Log Off Signed on User. The ScreenSaver Settings displayed above can be launched from Screensaver Settings. In order to configure the Screensaver Idle Duration, just visit the Control Panel and configure your desired number of idle minutes after which this screensaver must be launched. This Idle Screensaver can be used for enhancing Security & limit unauthorised user login, for Saving Power, and other similar purposes. This Screensaver will just work like a regular screensaver and will not utilize any cpu resources or ram when you are actively using your computer. 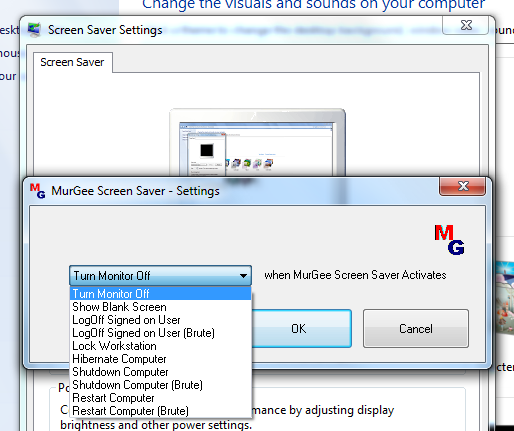 The Launching of the Screensaver is controlled by the Windows Operating System and other parameters can be controlled using Screensaver Settings of Control Panel and the selectable options provided by this Idle Screensaver.